The barbecue sauce in this dish deepens the flavour and adds a tasty zing. Heat large nonstick skillet sprayed with cooking spray on medium-high heat. Add peppers and onions; cook and stir 6 to 8 min. or until crisp-tender. Transfer to large bowl; cover to keep warm. Add meat, garlic and black pepper to skillet; cook and stir 3 min. Stir in soy sauce; cook 1 min. or until meat is done, stirring occasionally. Add barbecue sauce; cook until heated through, stirring occasionally. Combine meat mixture and vegetables. Serve over rice. If yellow peppers are not available, use another red or green pepper instead. 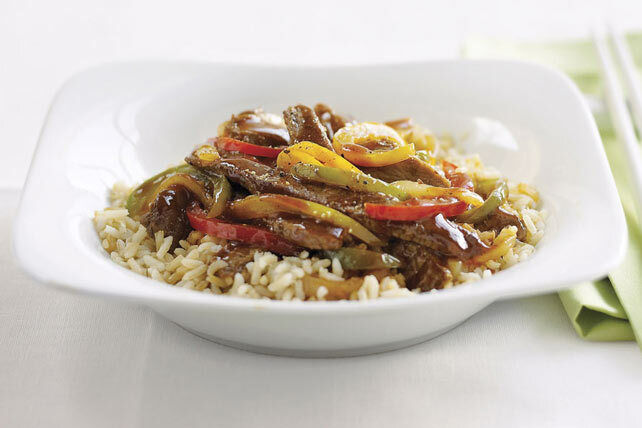 The colourful peppers in this tasty meal are an excellent source of vitamin C.